Cha-ching! I bought it a few years ago at a furniture consignment store for $125 and while we were in our last house it served as our main sofa in our living room. It didn't quite go with what I had planned for our new living room, though, so we moved it upstairs and had put off trying to plan a room around a green velvet sofa -- a bit of a daunting task for me. 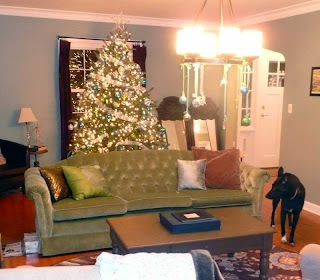 Here it is in the living room of our last house at Christmas time. But after moving it into its new place in the nursery I honesty don't know if there is anything more perfect for this room. It works amazingly well with the color scheme and it fits perfectly in front of the window. It matches the green pom-poms on the curtains exactly, too. Add a few throw pillows and it will be just perfect! Oh my word, I love it! I have a green velvet rocking chair that was my grandmothers in my sons nursery. I actually designed his room around it and my entire family thought I was nuts-o for wanting the green chair! Love it!! Perfect, you all will fit on it! Isn't it always the best when you take something from one room to another & it just "works"?! This looks so good! I love it!! So cozy! Would have never thought of adding a couch in a baby room -- great idea! And while I would probably pass on the couch in a store, it looks absolutely amazing in that room!! Nice Sofa, Everything put together very well and it's looking very interesting to me. The color of sofa is very cool green is my favorite color. i just found your blog today and have managed to click through every single post. Thank you for posting so many great ideas. I LOVE this green couch so much. 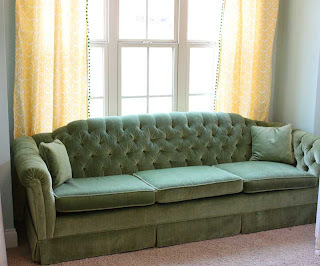 I have a similar green corner couch stuffed in a back room in my mom's house in GA. Sadly it was too large to move to Los Angeles with me. I dream of a day when i have a large enough apartment to put it in. These furniture are really nice. 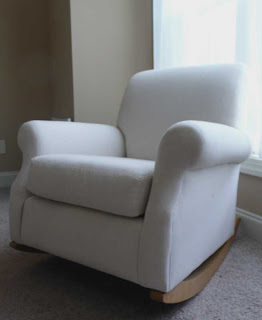 But the white recliner in really amazing. This look like best rated recliners. I wanna buy it ASAP.